For years, Bánh Cuốn (Vietnamese steamed rice rolls) has never stop to demonstrate its long-lasting perfect comfort food to food lovers. When people need something light, delicate yet flavorful, Bánh Cuốn is an inescapable dish quickly passes voting to be named in the menu. For those are familiar with Bánh Cuốn, no savory substitute is likely. For those have not yet ever try the dish, once taste it, people soon fall in love with very light but flavorful and earthy rolls. If you come to Hanoi, please do not miss Banh Cuon - Vietnamese Steamed Rice Rolls. 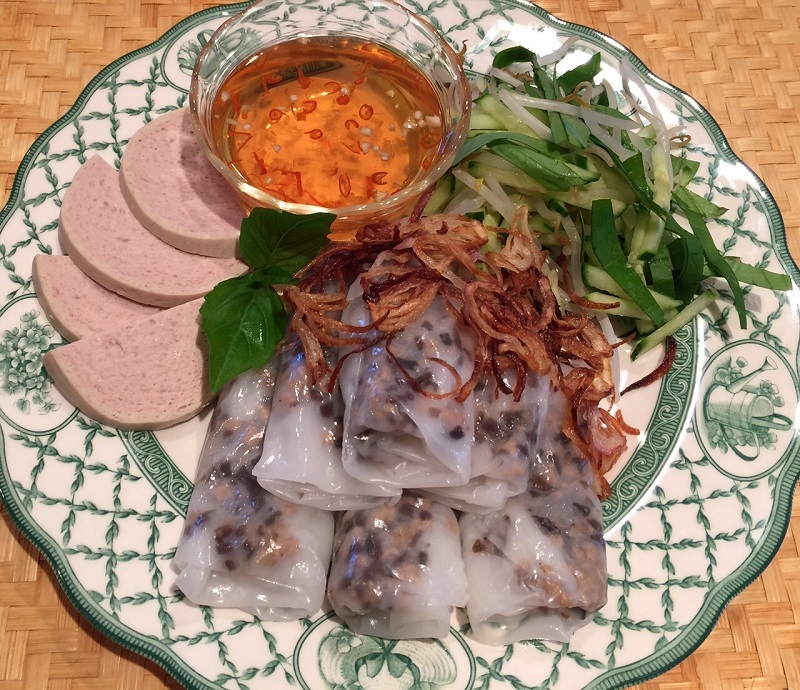 “Banh Cuon” looks like a soft spring roll, filled with a mixture of pork, onions, wood ear mushrooms, and fish sauce. It tastes delicious and the ingredients are actually common foods. 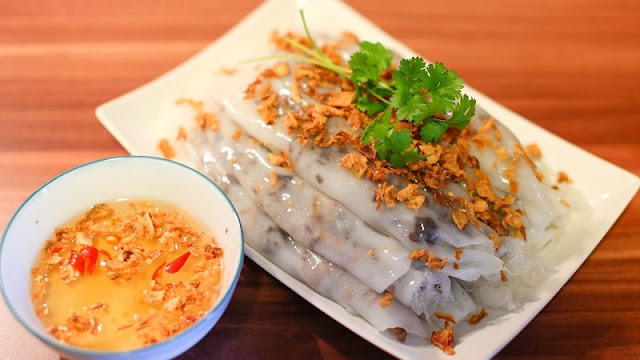 Banh Cuon is made from a thin, wide sheet of steamed fermented rice batter filled with a mixture of cooked seasoned ground pork, minced wood ear mushroom, and minced shallots. Sides for this dish usually consist of chả lụa (Vietnamese pork sausage), sliced cucumber, and bean sprouts, with the dipping sauce which is fish sauce called nước chấm. 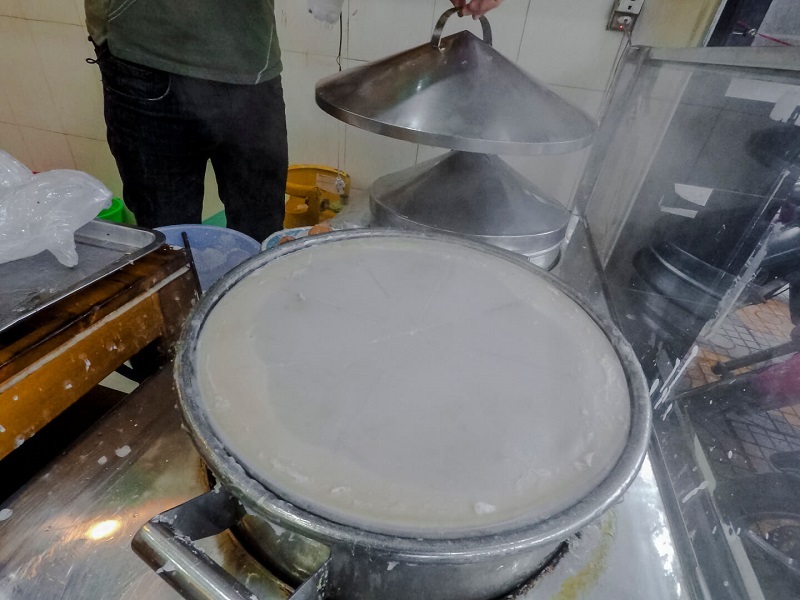 Sometimes, a drop of cà cuống, which is the essence of a giant water bug, Lethocerus indicus, is added to the fishsauce for extra flavor, although this ingredient is scarce and quite expensive. Starting with a steamed rice roll cooked on a pot, covered by thin fabric, until it is very thin. Then it is scrapped off the pot with a flexible bamboo stick. After that, the roll is filled with a mixture of pork, wood ear mushrooms, onions, and fish sauce. When and where to eat? Banh cuon stands face their rush times during breakfast and dinner, so it is difficult to find stalls still selling the dish in late morning or evening. Use your better judgment when eating from street vendors, but on average I find that banh cuon carts are some of the cleaner carts on the street, and wearing plastic gloves is a common practice among these vendors. A plate will usually cost between 15,000 and VND20,000 on the street and, if you are afraid of the carts, between 25,000 and VND50,000 in some local restaurant. Let's watch and yummy Banh Cuon.